Along this segment, the trail stays near the river allowing hikers to hear its rapids. 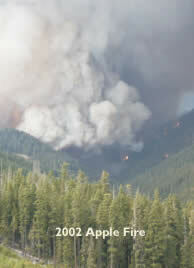 You'll pass along the edge of the 17,000-acre human-caused Apple Fire of 2002. Here, the North Umpqua River stopped the fire from spreading farther north. Along this segment, you will see burned trees and the beginning of the natural regrowth process.